Felony convictions can be devastating to one’s life. They can result in a prison sentence, financial penalties, being required to register with the state, not being able to get a job, and in the loss of one’s right to carry a firearm. Someone facing such charges is in a serious situation and they require immediate assistance. Contacting an experienced criminal defense lawyer can make a crucial difference in how your future is impacted. I am a Peoria attorney representing those who are charged with a felony. Contact my office today to schedule an initial consultation. It is important to understand that the above-discussed sentence ranges can be increased to an “extended term” if certain aggravating factors were present during the offense. Such factors include the defendant’s having a prior criminal record, the commission of a hate crime, or whether a firearm was used. Illinois felonies will be heard in the Circuit Court. Charges will be brought after a preliminary hearing is held or after the prosecutor has gained an indictment from the Grand Jury. The defendant will have the right to demand a speedy trial. 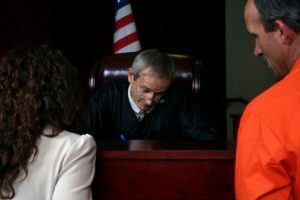 Such a demand will result in the case going to trial within 120 days if the defendant is in custody and within 160 days if the defendant is out of custody. The case will be decided by a jury and, if convicted, the defendant will be sentenced by the Judge. Nothing is more important than one’s freedom and it is strongly suggested that you retain a lawyer immediately. I am a Peoria criminal defense lawyer defending those charged with a felony. I will use your initial consultation to gain an understanding of what happened and to help you learn what to expect from the process. I will immediately acquire all available evidence from the prosecution and will launch my own investigation into the matter. If the facts of the case warrant it then I will file Motions to suppress statements made to law enforcement or to exclude other evidence from the Court proceedings. I will aggressively represent you at trial and protect your rights throughout the process. My office is ready to assist you. Contact us today. In addition to Peoria, I service the cities of Bloomington, Eureka, Galesburg, Morton, Normal, Pekin, Springfield, and Washington. I also serve the counties of Fulton, Knox, LaSalle, Marshall, Mason, McLean, Putnam, Rock Island, Schuyler, Stark, Tazewell, and Woodford. I also handle federal cases in Urbana. If you are charged with a felony then you have enough to worry about. Being able to get of hold of your counsel, or their performance, should not be a cause for concern. I strive to provide a level of service and personalized attention that is not common among law firms. I typically provide clients with my cell phone number, can be reached via text message, and I make myself accessible throughout the process. I draft my own Motions, handle all matters in my office personally, and have been practicing law for over twenty years. I believe that the accused are entitled to effective representation and providing it is my priority. Felony matters I handle include, but are not limited to, federal charges, violent crimes, and white collar crimes.